Photo courtesy of the National Library of Ireland. Aiden Kenny from Frontend.com gave a presentation at 100 Archive’s ‘Save As’ event the National Library of Ireland on Wednesday 22 August. The event addressed issues of how we shall preserve digital content — websites, apps, software and systems — when our means of making, using and saving them evolve so rapidly. 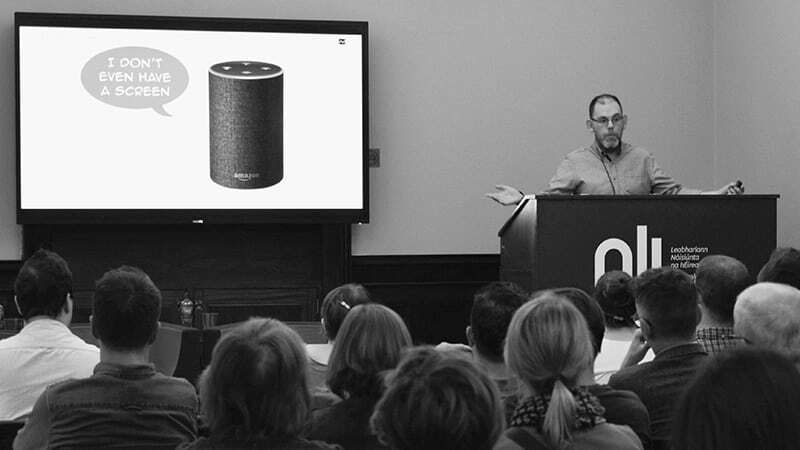 Aiden’s talk investigated whether design practitioners are taking the right approach in how they approach preserving digital design for future audiences. The working practices of digital designers have evolved such that their design output is never truly fixed, and always in a state of flux. Aiden considered approaches to how one would archive digital outputs at today’s level of complexity, where the digital products we work on are complex, multi-faceted, multi-platform, and continuously iterated. Much digital design activity today is concerned with designing experiences rather than creating artefacts. The combination of all of these factors sets many interesting challenges for future archives. Aiden explained how at Frontend.com we think of design as a narrative. We believe it is important to capture as complete a representation of that narrative as possible. Aiden’s talk concluded with an explanation of our efforts in Frontend.com to use narrative video to capture the overall experience of our digital products, by telling the story of those products. For if we only capture the pixels, then we risk losing sight of the larger picture. 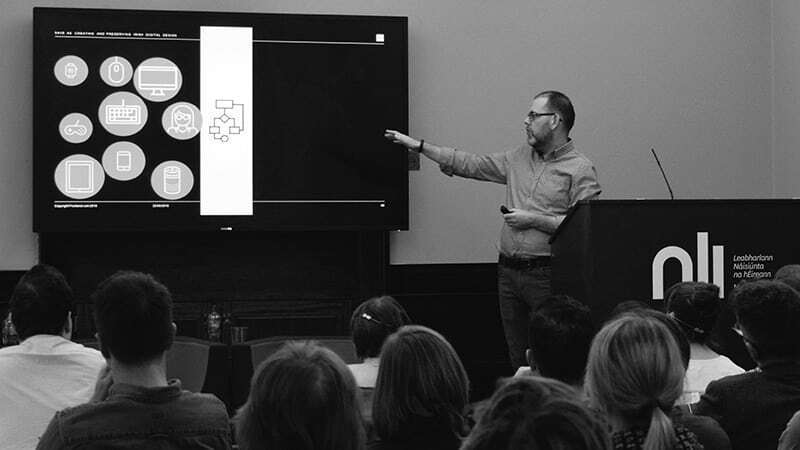 ‘Save As: Creating and Preserving Irish Digital Design’ was presented as part of Heritage Week and the European Year of Cultural Heritage. Other speakers included design historian Sorcha O’Brien and Joanna Finegan of the National Library’s Digital Collections Department. The 100 Archive is a community-centred initiative to capture and record the diverse history and practices of Irish graphic design.